The third annual Sunset Strip Music Festival (SSMF), set for August 26-28, 2010, has announced 2010 honoree Slash will perform with Fergie and Myles Kennedy — two of the vocalists on Slash's self-titled album, which topped the charts as the #1 rock album and #3 on The Billboard 200 list in its first week of release — during the Saturday, August 28 outdoor street festival. Organizers also announced Common, Semi Precious Weapons, Neon Trees, Big B, and Steel Panther have been added to the street festival lineup that is being headlined by the previously announced Smashing Pumpkins. Additionally, a mix of more than 50 local and national artists — including Adler's Appetite and Ankla — will perform within the venues during the August 28 street fest date. The boulevard is closed to traffic between Doheny Drive and San Vicente Boulevard and will be transformed into a premier concert destination with outdoor stages, beer gardens, a VIP lounge, food trucks, interactive experiences and live performances within the venues during the day. 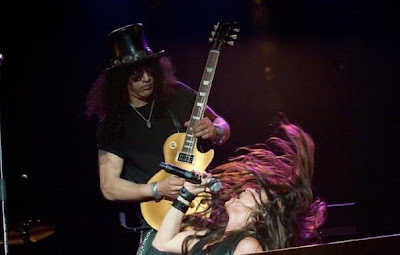 The three-day fest kicks off with a tribute to legendary guitarist Slash at the House of Blues on Thursday, August 26. Tickets are currently on sale via Ticketmaster. A portion of all ticket sales benefit Los Angeles Youth Network (LAYN), a charity personally selected by honoree Slash. LAYN's mission is to end homelessness, one kid at a time, by providing shelter, food and counseling for the abused, neglected and abandoned. For more information about SSMF, including additional lineup announcements, visit www.ssmf.com. Known for his skillful, soulful hard-rock guitar solos, Slash's career has continued to grow from his early days performing at the Whisky A Go-Go with Guns N' Roses to his collaborations with Michael Jackson ("Black And White," "Give In To Me"), Ray Charles, Stevie Wonder and directors Quentin Tarantino and Darren Aronofsky (core contributions to the Jackie Brown soundtrack and the signature sound of the score to The Wrestler). Slash traces his love of music and exploring spirit to his childhood in England, where his father introduced him to the sounds of The Beatles, The Rolling Stones, Yardbirds and other classic, groundbreaking acts. He got an insider's view through his teen years after the family moved to Los Angeles, his father a graphic artist who worked with David Geffen for such artists as Neil Young and Joni Mitchell and his mother a costume designer for many top pop artists. Almost on a whim, he and friend Steve Adler started playing music together; Slash on guitar and Adler on drums. In the early '80s, influenced by such bands as Lemmy's Motohead, he and Adler formed a band, recruiting bassist Duff McKagan. Within a year, with the addition of singer Axl Rose and guitarist Izzy Stradlin, the venture had morphed into Guns N' Roses — and by the end of the decade had changed the course of rock history. Previous SSMF honorees include Lou Adler, Mario Maglieri and Elmer Valentine, who helped shape the live music experience on The Strip with the creation of The Roxy Theatre, The Rainbow and the Whisky A Go-Go, and rock icon Ozzy Osbourne, whose first US performance was at the Whisky with Black Sabbath in 1970.